Foree Fest '07 with Ken Foree !! 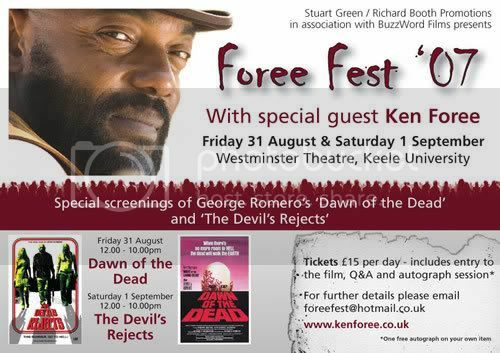 Ken will be appearing at Foree Fest '07 at the Westminster Theatre at Keele University, in the UK! The event is being organised by Stuart Green and Richard Booth in association with Buzz Word Films. The event will feature a screening of George Romero's 'Dawn of the Dead' on Friday 31st August, with an introduction by Ken, Q&A session and an autograph signing, with a free autograph for each ticket holder on their own item. On Saturday 1st September will feature a screening of Rob Zombie's 'The Devil's Rejects', with an introduction by Ken, Q&A session and an autograph signing, with a free autograph for each ticket holder on their own item. Tickets are priced at £15 for each day.